Bombs, guns and knives have long been the tools of choice for terrorists, but the latest form of deadly mass violence has weaponized something far more mundane: motor vehicles. Six of the last nine multiple-casualty terrorist attacks in Western Europe have used trucks, vans or SUVs that are driven into public crowds, sometimes over long stretches before the attackers are brought to a stop. The violence sometimes continues when attackers flee their vehicles and inflict further damage in the surrounding area. As this timeline shows, terrorism that begins with vehicle contact has been particularly deadly in the last few years. August 17, 2017, Barcelona, Spain — A van plowed into pedestrians in the Las Ramblas tourist area, killing 13 and injuring more than 100, according to officials. June 3, 2017, London, England — A van was driven into crowds on London Bridge, after which the attackers left their vehicle and stabbed several people in the area. Seven people were killed and nearly 50 injured. April 7, 2017, Stockholm, Sweden — A truck was driven into a Swedish department store, killing four people. March 22, 2017, London, England — An SUV drove into crowds in London near Parliament. Four people were killed by the vehicle, and one police officer was stabbed after the driver left the vehicle. December 19, 2016, Berlin, Germany - A truck was driven into crowds at a Christmas market, killing 12 people. July 14, 2016, Nice, France — A truck was driven into crowds on Bastille Day, killing 86 people. An NBC News analysis conducted along with the Global Terrorism Database, an organization that researches recent terrorist attacks, found that this pattern is relatively new. As the chart below shows, "vehicle contact" terrorism — in which a vehicle is not used as an explosive device but as a direct means of killing — is on the rise. After the use of planes in the 9/11 attacks, other planes and vehicles were not immediately used in the years after to instigate similar attacks. That has changed. As was the case in the June London attack, vehicles are often just one component in a terrorist attack. More deaths occurred after the London attackers left their van than did from vehicle collision. "Vehicles are used in concert with other types of weapons," said Erin Miller, program manager for the Global Terrorism Database, who has analyzed the rise in this type of attack. "It might be a situation where a car drives into a crowd and then the driver gets out," said Miller. "Other times, the vehicle is used specifically to breach security or get past a gate. That might be a situation where it’s used in context with explosives." These attacks are occurring at higher rates in Europe. The chart below shows that nearly as many fatalities from vehicle-contact terrorism occurred in Europe between 2014 and 2016 as did in the Middle East — despite a far greater number of terrorism incidents occurring in the Middle East during that period. Few attacks had occurred in the United States — though a driver of a car recently killed one during a rally in Charlottesville, Virginia. The TSA report warned of the dangers of truck-ramming terrorism here. The most lethal terrorist incident involving vehicle contact in the United States in recent years involved an Ohio State University student who drove his car into a crowd last year before slashing several people with a butcher knife. The attacker was killed by campus police but no other deaths occurred in the attack. The TSA report warns that commercial trucks may pose the greatest risk, as they can be used to knock down gates or other security infrastructure. The UK government is exploring the idea of installing kill switches into vehicles like these. Terrorism experts say the rise in vehicle attacks appears to coincide with an ISIS leader's call in September 2014 to use whatever weapons or tools, including vehicles, are available to kill "infidels." The leader, Abu Mohammed Al-Adnani, in a speech following coalition air attacks on ISIS, specifically suggested jihadis kill Westerners anyway they can: "Smash his head with a rock, or slaughter him with a knife, or run him over with your car," he said. Al-Adnani was killed in Syria in the summer of 2016. 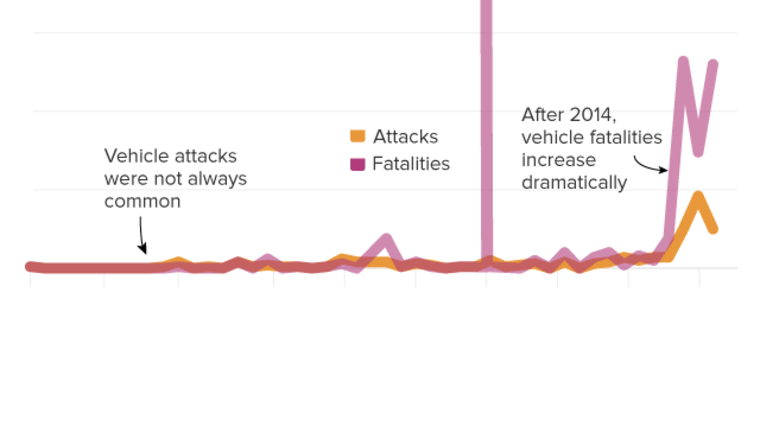 The rise that begins in 2014 coincided with two vehicle attacks that occurred in France in 2014 — in Dijon and Nantes. The attacks caused one death and more than a dozen injuries, though recent vehicle attacks are far more lethal than what came before.